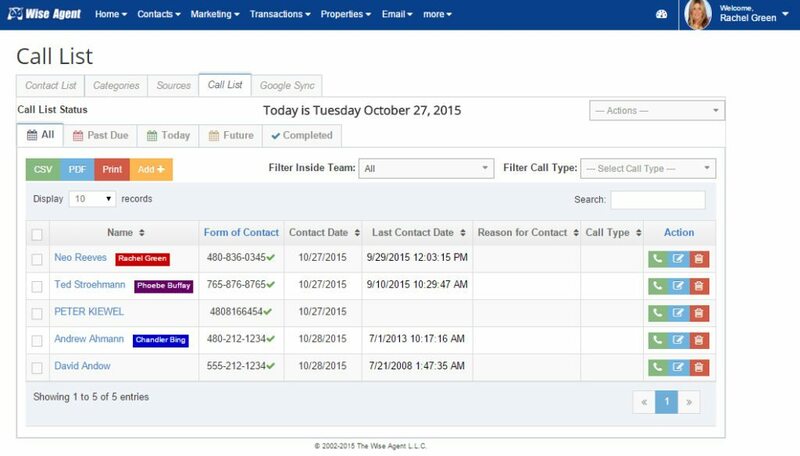 CRM software doesn't have to run your company, only your contacts. Third-party software integrations are best when used to fill a hole in an otherwise sound solution. Social media conversations should be a critical part of every agent's lead management strategy. Wise Agent is a stew of features, packing a ton of common ingredients and functionality from existing systems into a single interface. The mass integration of other popular tools begs the question, why also pay for Wise Agent? It says it’s a CRM, but Wise Agent’s inner workings indicate otherwise. I don’t know where it lands. It certainly combines contact management with lead monitoring and outreach, which is what a CRM should do. It also offers transaction management, direct marketing and listings management, which is more than what a CRM should do. Wise Agent’s development seems rooted in a whiteboard session of mostly good ideas that someone in charge considered all great. The software struggles because of this intrinsic refusal to say “no” to a feature, the source of which could be found in its founder’s similarly verbose About Us website narrative. There is value here; you just have to turn over a few features to find it. The calendar-based dashboard is visually cluttered, and I feel new versions should focus strongly on revamping the UI. Still, what’s most important is easily found. Hot Leads are posted in the top left corner, and they can be called in a single click. Contact management features include the capability of importing any Gmail interactions one has had with a customer to be included in “conversations.” That’s a good way to bring what’s outside in. A contact’s social media activity can also be made part of their record, and you can monitor it regularly to stay relevant with your database. To reach out to your contacts, Wise Agents offers an extensive list of pre-written letters and communications. Of course, you can construct your own. 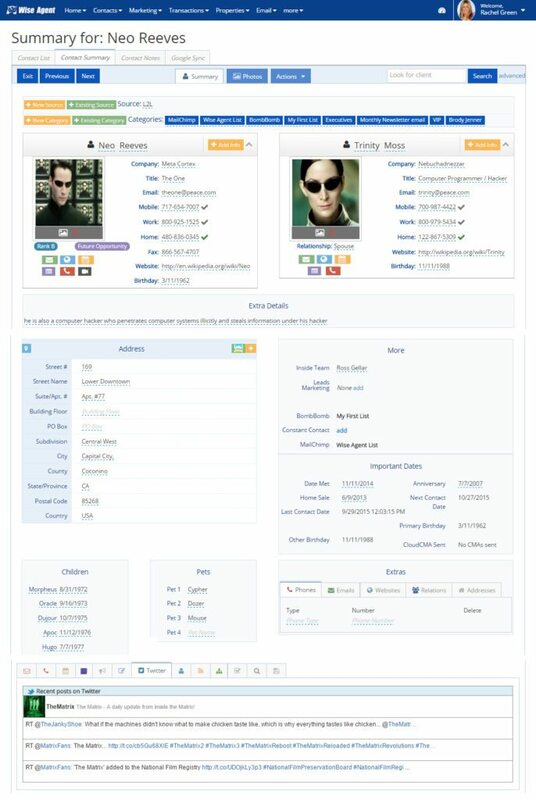 Wise Agent’s transaction management features are nicely done. It uses a task-based approach to guide agents through the process and quickly track the status of a pending sale. Default templates of task lists are included but can be edited and saved based on office workflow. Wise Agent’s transaction management features are nicely done. I remain on the fence about the number of third-party integrations Wise Agent enables. Users can link accounts from BombBomb, Zillow, Cloud CMA, HomeJunction, Houses.com, Condos.com, BoldLeads, Happy Grasshopper, Evernote, MailChimp, ConstantContact and several other lead-generation and marketing tools. Because many of these tools perform well on their own, where’s the argument for buying Wise Agent? What’s the special sauce? BombBomb has systems in place for long-term marketing. Evernote manages documents exceptionally well. MailChimp and Constant Contact are both superb email marketing managers. I do like that Wise Agent sees value in Fast Forward Stories‘ simple explainer videos. That’s unique. It’s evident Wise Agent was built to be flexible, to work with agents already entrenched in any number of lead-generation or email marketing accounts. And that’s great — in theory. If I were to comment on this software’s CRM features, I’d say it’s pretty good, despite the dated look and feel. When jumbled with so much ancillary functionality, I can’t help but wonder if Wise Agent’s role in this digital ratatouille is being overpowered by its seemingly subservient spices.